Is the American Dream still attainable? Eileen Murray thinks so. She herself is a prime example that hard work, a sense of humor, and perseverance can get you there. Every inspiring story has a starting point. 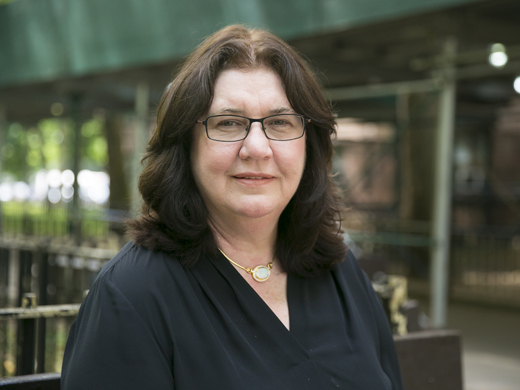 And Eileen Murray’s story begins in the Dyckman Housing project in Inwood, a neighborhood on the northernmost tip of Manhattan. These were not the projects of gang-controlled stairwells where drug deals went down, at least not in 1958 when Eileen was born, one of nine children to Irish-American parents. There was a sense of pride and community, well-kept apartments and grounds. There was a chain-link fence to keep kids off the grass, and you adhered to the rules or you got a clip on the ear from an adult, any adult who happened to be passing. Far from it being a tough beginning, Eileen remembers Dyckman Housing as a wonderful place to live. It was a place where people didn’t lock their doors. On Thursday nights the neighbor down the hall – “she was like a grandmother” – would host a Pokeno game and people would come and play. And on Friday nights, when Uncle Pete came over with his accordion, neighbors and friends would gather in the Murrays’ apartment. “It was fun,” Eileen remembers. All that changed when drugs overtook the neighborhood in the late 60s- early 70s. The neighbors stuck together, but they no longer left their doors open. Eileen’s father, a former serviceman, headed the tenants’ association, and he and others would sit in the lobby and keep watch for intruders. It wasn’t so much fun anymore, and it didn’t feel safe. The park across the street, where Eileen and her friends and siblings used to sled down Snake Hill when it snowed, became a no-go area. But still the family stayed on, until… Late one night, returning home from her job at Grand Union, having stayed behind stacking shelves, Eileen found her neighbor, Mr. Angrisano, lying on the lobby floor in front of the elevator. He was dead from a gunshot wound to the head, his pockets pulled out and emptied of cash. “I think it was about five dollars,” Eileen recalled, pointing to the exact spot on the floor. This was during a visit this summer to her old apartment building. The memory, 40 years old, as vivid as it was on that night. It after Mr. Angrisano’s murder (no one was ever convicted of the crime) that Eileen’s mother finally agreed to leave Dyckman Housing, moving the family to Riverdale in the Bronx. At 93, Eileen’s mother is healthy and hearty, and still an inspiration to Eileen. “If I never met another person in my life, I’d have learned enough just being around my mother,” she says. In 1980, fresh out of Manhattan College with a B.S. in Accounting, Eileen struck out for Wall Street. Back then, in her own words, “only 0.5 percent of women held senior positions in the financial industry.” But Eileen was unfazed by the statistics. As a student she’d been discouraged from pursuing math as a subject and finance as a career. Didn’t she want to study nursing or become a teacher? No! The fact that she was a woman didn’t strike her as a disadvantage. She was used to the rough-and-tumble of a large family where chores were shared equally between brothers and sisters, so it didn’t occur to her that “hard work wouldn’t be rewarded for what it was.” It was later, as she began to climb the corporate ladder, that she noticed the disparity. Eileen’s solution was to work twice as hard. She was armed with a wonderful sense of humor. When one of her Ivy League colleagues would say, “‘Manhattan College,’ never heard of it!” She would quip right back, “Harvard, never heard of it.” Her family ethic was one of hard work. All through high school and college, she worked at Grand Union, but if she needed any extra motivation, she says it came from watching her father die, at just 58, of congestive heart disease in a hospital “that didn’t have an oxygen tank.” That, and wanting to get her family away from what had become “a war zone,” fueled her ambition. Her first accounting job was with Peat Marwick (later K.P.M.G. ), where she started out making less money than she had been making at Grand Union. Four years later, in 1984, she joined Morgan Stanley (M.S.) as an analyst in the controller’s office. Ten years later she was running the controller’s office. And when M.S. merged with Dean Witter, she was named the Controller and Chief Accounting Officer for the firm. Anyone else might have been content to sit back and rest on their laurels, but Eileen was ready for something new. In 2002, in a move that surprised many at M.S., she joined Credit Suisse First Boston (C.S.F.B. ), to head up its global technology, operations and product control division. She became the first woman ever to serve on C.S.F.B.’s Executive Board. M.S. enticed her back with the elevated position of Managing Director, Head of Global Technology and Operations, and member of the firm’s management committee, supervising 10,000 employees and a $5.5 billion budget. She would stay at M.S. for another two years, retiring in 2007. For Murray, who had worked hard all her life, retirement didn’t sit well. Soon she joined Duff Capital, as co-CEO, president, and partner. In 2009, Bridgewater Associates, the largest hedge fund in the world, came calling and made her an offer she couldn’t refuse. Two years later, she was named co-CEO. Kathleen Murphy of Fidelity, who knows Eileen through their shared service on the FINRA Board of Governors, recently said: “Eileen is refreshingly candid, objective, results-driven, extremely down-to -earth, wonderfully family-oriented and someone who has a terrific sense of humor.” The following is an excerpt from our recent interview with Eileen, which took place at her Bridgewater office in Stamford, Connecticut. I grew up in Dyckman Housing project. I am one of nine. I have five brothers and three sisters. I lost one brother, Jim, to cancer in 2012. My dad was a serviceman. My mom worked for the phone company. I am number six. I am the oldest of the second batch, and my mother always says, “Make sure you tell people – from the same parents!” I have a sibling who says, “We grew up poor,” but I never felt poor at all. I really didn’t. The neighborhood was wonderful. It was truly a melting pot. The people who lived there came from all over the world – from Tanzania, Greece, Lithuania, Puerto Rico… We lived in 9C. Right across from us was a couple from Cuba with their daughter. Across the hall from them was a woman from Italy. Then down the hall there were people from Germany who had survived the Holocaust. There was really a lot of diversity, both in nationalities and culture as well as in color. We never locked our door – we didn’t need to back then. People looked out for each other. You minded your Ps and Qs because someone always had their eyes on you. My mother’s Uncle Pete played the accordion, so he would come over and play on Friday nights and people would come by and listen… The lady who lived next door to us was like a grandmother. She held a Pokeno game on Thursday nights. It was fun. My dad was in WWII, and Korea. He wanted to go to Vietnam, but did not. He was a very big supporter of the country. He felt that when the country needed you, you better stand up and go serve it, and he was heartbroken by what happened in WWII to people in the concentration camps. He never really talked about it at all to me, but I think war impacts young people. He earned three purple hearts, one bronze star, and one silver star. My dad was a great guy. He was a very, very well-read man, and he was a doer. When things started to change in Dyckman Houses, he did what he could. They had the tenants’ council and my dad served on it with other people and they would sit at a table downstairs and watch who was coming in and out. My mother met my father when she was 16 at an Irish dance. My father used to always say, “Thank God your mother married me.” He would tell us that my mother got him drunk – he had thought he was going to be a priest – but he married her anyway. He had a great sense of humor. He was young when he joined the service, I think 16. My mom says, “Young and good looking.” When my dad was in the service my parents traveled the country so they were in California, Indiana, Alabama, and Alaska and my mom, after the fifth child, said, “I can’t do this anymore. We’ve got to move back to New York and pitch a tent somewhere.” So that’s how we ended up in Inwood, in Dyckman Housing, which was built in 1951. My parents loved each other. I mean they argued, but they loved each other and that was enough. We were always a tight-knit family and watched out for one another. I was about 20. There was a guy, his name was Augie Angrisano. He and his wife Connie and his daughter Celeste lived straight down the hall from us. I was usually a little late coming in from Grand Union because we had to stack the shelves and this and that – and I came in and he was lying in front of the elevator on the ground floor. Someone had shot him in the head and emptied his pockets. I was very sorry for his wife and his daughter. They were lovely people, but I wasn’t frightened for me – probably because I was too stupid – but my mother was like, “We have got to move now.” So we moved up to Riverdale. My father had died at that time. He was only 58. My father died from congestive heart disease in a hospital that didn’t have an oxygen tank. I don’t want that for my family. I didn’t want them living in a place that had become a war zone. To me, it was, how do we make sure, through education and jobs, to never be in that position again. If I never met another person in my life, I’d have learned enough just being around my mother. She is a good person. She had a very tough life. She came over here on her own at 13. I remember when she worked at the phone company and she had these heels… I remember her putting cardboard in her shoes because she had holes in them and it was raining outside. She would always buy us something new, and she never complained. I knew right away when I joined the board that I’d found a home, and a group of people that I have a lot in common with. What I love about the Irish Arts Center is that it has never wavered from the idea that Irish culture isn’t just for Irish people, it’s for everybody. If that’s not hospitality shining through I don’t know what is. 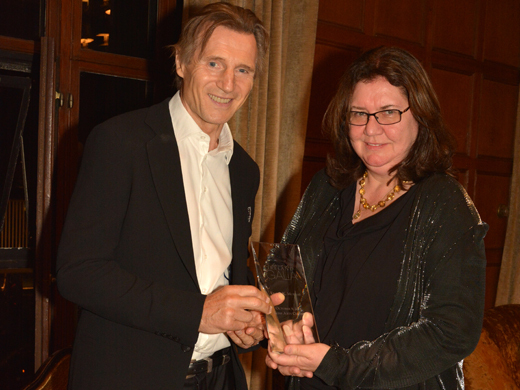 Liam Neeson presents Eileen with the Irish Arts Center’s Spirit of Ireland Award, in October 2015. I not only like my siblings, I love them, and I never felt as though I came from a big or small family – I just came from where I came from. Everybody had their thing, you know? I think what helps coming from a big family is that it is not all about you and you better get over yourself and have some self-deprecation or you are going to end up in some psychiatrist’s office. I think I have a good sense of humor in terms of “C’mon, get over yourself – no one died.” Someone said to me one time, “That is not a high enough standard.” I said, “No, your standard is too low.” I think it is good to laugh. I think it is healthy; I think it makes you feel good… And I sometimes say things that just come to me and I don’t really mean to say them and I probably shouldn’t say them, but there you go. I have lost people and it breaks your heart but I‘ve never seen anything so senseless, so terrible as 9/11. We lost eleven people from Morgan Stanley. There were kids who lost both of their parents. It gave me such perspective, 9/11. Peat Marwick was a public accounting firm. I was there for four years, and then I went to Morgan Stanley which was an interesting place back then. I remember someone saying, “Ah, I never heard of Manhattan College!”(Harvard people!) And then I’d say, “Well, I never heard of your school either.” I was at Morgan Stanley for eighteen years. I kind of grew up there. I had never been much further than Jersey and when I joined Morgan Stanley, I traveled Europe and the world. I remember the first time I went to the Churchill bar in London with this guy Ross who was in treasury and worked with me, actually worked for me. He went on ahead, but I was told, “Madam, women are not allowed in the bar.” I was like “Is this guy for real?” And he was for real! And so I’ve always really appreciated being here in the U.S. When I first started working, the number of senior women on Wall Street was, I think, 0.5 percent and now it is maybe 17-18 percent. I am not saying we should be satisfied with where we are – we should continue to plow ahead and it should be 50-50. I think we are on the verge of a lot of things changing. But I also want to make sure we celebrate how far we have come. Until 1963, a woman couldn’t have a credit card without her husband signing on for it. My mother couldn’t get job at the phone company when she first came here because she had an Irish accent. In this country there were signs posted, “Irish need not apply,” so how long did that take to change? It took quite a bit of time, right? The founder is very focused on radical truth and radical transparency. I think that’s great and I certainly believe in it. I am pretty straightforward. Certain people though – it is hard for them to hear things. To me, the most important thing is that we are having a conversation. I want to transmit something to you. What’s most important to me is that you receive the message. Curiosity, respect, a mutual understanding that we can learn from each other. I have no tolerance for know-it-alls. Work hard. Don’t expect anything for nothing. Ask for help. Find someone who is good at what you are not and see if they will help you. I think it’s still achievable. At least it has been my experience – you may be in a bad neighborhood and you may be tempted to do drugs and this and that, but if you work really hard, you can climb out of it. For me, success is not about money. Developing other people, giving them the opportunity to succeed. My biggest priority as the CEO is to make sure there is someone behind me that can get on the horse and win the race. Hello – I’m a devoted reader of the magazine. My mother’s parents were from counties Galway and Donegal. I’m a CPA “by day” but a passionate genealogist also! I would love to help find the name of the African-American woman that was so kind to Eileen Murray’s mother during her immigration journey. If Eileen could tell me her mother’s maiden name and approximate date of immigration, I will gladly sear the ship manifest records for this. It would be my pleasure. My email, as above, is jmgrandinetti@msn.com and my cell is 570-709-1362. 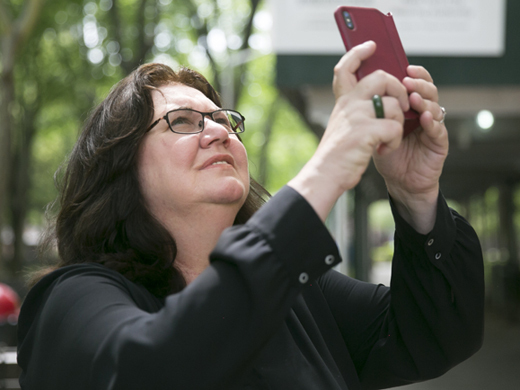 I find this story by Eileen Murray most interesting, especially her strong connection with Inwood in Upper Manhattan. I lived in that neighborhood for 20 months after I arrived in the U.S. as a teenager in 1958 -and would join the Marine Corps then. In the late spring, summer and early fall of 1961, I was on a Med cruise in the USS Freemont. The messhall of that Navy ship had a mural of Inwood on its walls, which reminded me of my old neighborhood every day, especially the month I spent on K’P. duty on the Atlantic. What a wonderful story! Eileen is definitely living the American Dream. And yet she is one of the most impressive people I have ever known. We met while I was working at Credit Suisse. No matter how high her title, she was always approachable to people at all levels. I had many of the same experiences that you had; I also went to Manhattan College. I now have three degrees in education and I have been a teacher for 37 years. I grew up in Highbridge near Yankee Stadium. I had many friends there.